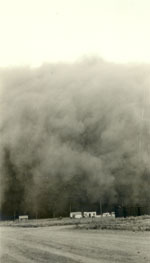 Description: "Approaching dust storm in Middle West"; postcard; "Conard, G. C. Ks #19"
Description: Farm equipment buried in dust; "Result of dust storm in the Middle West"; postcard; "Conard, G. C. Ks #3"
Description: "Dust cloud rolling over western Kansas town"; postcard; "No. A"; rubber stamped on back "Rabbit and Dust Storm Postcards, 50c per doz, assorted, postpaid, Stovall Studio, Dodge City, Kansas"
Description: Postcard of jack rabbits in snow. Labeled "#73 Some Jack Rabbits" Probably some kind of spoof. Handwritten note on back seems to say western Kansas 1912. Description: back of 2008-0033; Postcard of jack rabbits in snow. Labeled "#73 Some Jack Rabbits" Probably some kind of spoof. Handwritten note on back seems to say western Kansas 1912. Description: Jack rabbits and what looks like a steam threshing machine in snow. 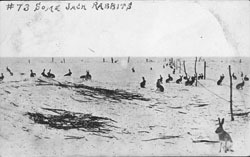 Labeled "#74 Jack Rabbits Snow Bound." 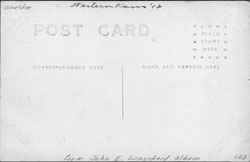 Handwritten note on back indicates western Kansas 1912. Postcard. 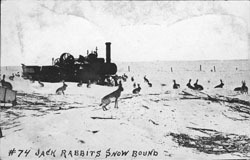 Description: back of 2008-0035; Jack rabbits and what looks like a steam threshing machine in snow. Labeled "#74 Jack Rabbits Snow Bound." 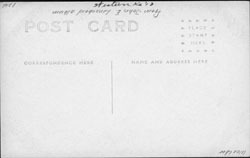 Handwritten note on back indicates western Kansas 1912. Postcard. 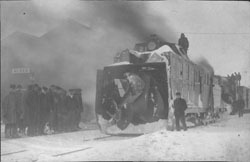 Description: Rotary snow plow (railroad) at Alsen, North Dakota. If it's the same as 2008-0038, the date is 13 April 1907. 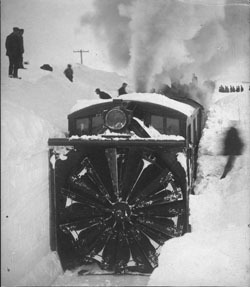 Description: Rotary snow plow (railroad) in deep snow banks. If it's the same as 2008-0037, it is near Alsen, North Dakota. Dated on back 13 April 1907.